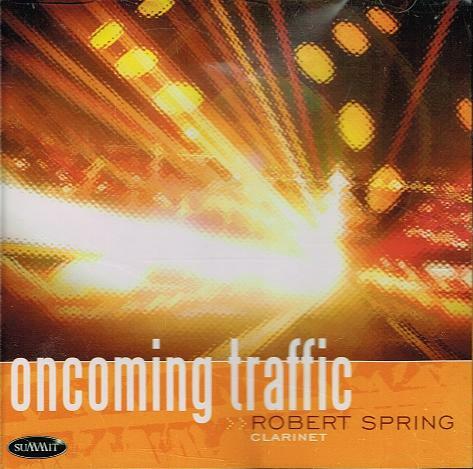 “Robert Spring is the head of the clarinet studio at Arizona State University as well as principal clarinetist with the Ohio-based Pro Musica Chamber Orchestra. Spring has had a well deserved reputation for many years as being one of the finest, and best known, clarinetists in the country. This recording provided much excitement for me as a classically-trained clarinetist myself, and also serves as a perfect testament to Spring’s appreciable technique and his commitment to expanding the repertoire for his instrument. 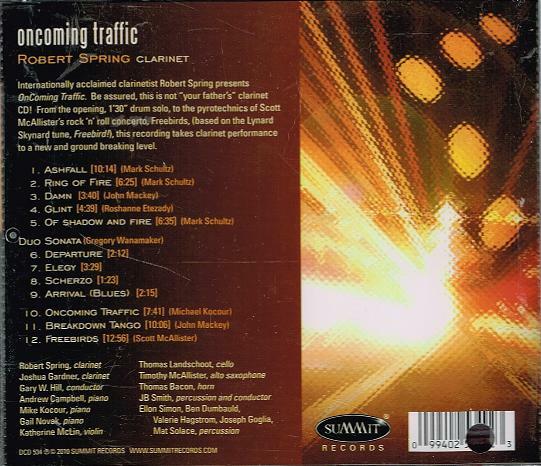 There are actually numerous high-quality performers on this recording but the real “stars” are Bob Spring and the composers. Each work on this disc is very jazz-inspired, exciting to listen to, and a very captivating addition to the clarinet “crossover” catalogue. The works by Mark Schultz are immediately attention- getting. The percussion solo, almost a jazz opening riff, on “Ashfall” sets the stage for some exciting tight ensemble playing by Spring and also the incredible. Thomas Bacon on French horn and percussionists JB Smith and Ellon Simon. The title is a reference to volcanic eruptions, that from Ashfall Beds Historic Park in Nebraska, in particular. Certainly the music starts, flows and finishes with “eruptions” of rhythm and energy. Schultz’s “Ring of Fire” is another volcano-inspired work and contains some of the same fast, syncopated and percussive drive of “Ashfall”. In this case, the wind players and pianist must also take up small percussion instruments and add to the sonic immersion. In addition to the fine playing of Spring, Bacon and Smith, kudos to the great piano work of Andrew Campbell on this piece. The last of the Schultz pieces played in this program is his “Of Shadow and Fire”. More “molten” energy is present in this wonderful, jazzy work for clarinet and piano. Inspired by the images of middle earth in Tolkien’s trilogy (the setting in mind is the author’s Balrog in particular), the clarinetist must handle fast, frantic “hot” passages almost like magnesium ribbon. In addition to Spring’s amazing kineticism, high praise goes to Gail Novak, pianist, a well known and highly-skilled accompanist, especially adept at new music and demanding scores. This disc also contains wonderful and captivating selections by John Mackey, Roshanne Etezady, Gregory Wanamaker, Michael Kocour and Scott McAllister. John Mackey might be the best known name among the composers represented, his works having been performed all over the world. “Damn” for clarinet and percussion was a commission from choreographer Robert Battle, later used by the US Synchronized swim team at the Athens Olympics in 2004. Mackey work is described by the composer as “dark, rhythmic and angry”. It places considerable demands on all the players involved and the result is an almost exhaustive display. Mackey’s “Breakdown Tango” is, for me, one of the most interesting pieces in this set. Also originally intended as a dance piece, the work is certainly a parody of tango and the clarinet provides an almost sarcastic response to the rather twisted parody on traditional tango forms being pronounced by the strings and piano. As the New York Times apparently commented, the work is “…at times, wonderfully trashy”. In these two Mackey works, be sure to listen for the fine playing of the percussionists under the direction of J.B. Smith as well as – in the “tango” – violinist Katherine McLin, cellist, Tom Landschoot and pianist, Andrew Campbell. “Glint” by Roshanne Etezady is another highlight of this collection. Etezady is presently on the theory and composition staff at ASU and has written works for a number of prominent new music specialists, including the ‘eighth blackbird’ ensemble. There is almost no way to describe this piece. It must be heard. The “glint” is truly the hard, shiny, edgy performance given by the duo performers, clarinet and saxophone. This might by the most jaw-dropping technical display on the program. The always incredible Robert Spring is joined by the equally amazing saxophonist, Timothy McAllister. McAllister is a well known master of his instrument and has premiered work by a number of composers, including names like Jennifer Higdon, William Bolcom and Chen Yi. Gregory Wanamaker’s “Duo Sonata” was, for me, another high point. This is another amazing piece for clarinet and saxophone and another attention getting performance by Spring and McAllister. The Wanamaker exists in four movements, each of which explores the range, color and expressive qualities of the clarinet and saxophone separately and almost as one unified timbre. The “Elegy” (second movement) is a very poignant departure in tone from almost everything else on this album, having been written in response to the 9-11 tragedy. A very compelling work. The title work, “Oncoming Traffic” by Michael Kocour is probably the most straight out and obviously jazz-inspired work in the set. Kocour is a well known jazz pianist, composer and arranger in the jazz studies program at Arizona State. This combination, and the piece itself, for clarinet, piano and percussion really does sound like a very entertaining and well played jazz club experience. Kocour based this piece on a pre-existing melody, “Oncoming Traffic”, that he wrote in 1989 and has worked or (‘realized’) into many of his compositions and improvisations since then; in this case wonderfully realized by Spring, Smith and the composer on piano. This amazing collection concludes with “Freebirds” for two clarinets and wind ensemble by Scott McAllister. McAllister, composition teacher at Baylor University, has written a large number works for concert band, wind ensembles of all sizes and has been commissioned by many universities and professional ensembles all over the country. Many of his pieces, like his “Black Dog”, are somewhat jazz and rock-inspired. The present work, “Freebirds”, takes its title and inspiration from the album by the iconic southern rock band, Lynyrd Skynyrd. A driving, ecstatic showpiece for two clarinetists and band, the work begins with a cadenza-like passage for the soloists, takes the listener through some high beautiful lyrical passages and ends in a virtuosic cadenza. This piece grabs hold of the listener and never lets go, providing a perfect closer to this amazing program. Besides the always amazing playing of Bob Spring, big compliments as well for the spectacular performance of the other clarinetist, Josh Gardner, who I know to be a terrific and dedicated performer. This is a great vehicle to showcase both their appreciable talents and that of the ASU wind ensemble.